The Island Golf Club was founded in 1890 thus making it one of the oldest golf courses in Ireland. Besides being one the first twelve golf clubs founded in Ireland, it is the third oldest in Dublin and predates Portmarnock Golf Club by four years. The club was unique in that it had no military connection and was initiated as a private proprietary club. The ten founder members, known as the “Syndicate”, only permitted others to join the club on an annual basis as annual ticket holders. Most of the members of the “Syndicate” were already members of The Royal Dublin Golf Club which was founded in 1885. However, The Royal Dublin Golf Club forbade golf on Sundays and this rule was not to the liking of members of the “Syndicate”. The visionary boat journey is thus described in the history of the club “A Century of Golf on the Island”. Besides referring to one hundred years of golf played on the links between 1890 and 1990, the “Century” part of the title also alludes to the cricketing term for “one hundred not out” to draw attention to a cricket match in which the legendary English cricketer W.G. Grace played in the early 1900s on the present eleventh hole, now known as “Cricket Field”. Incidentally, W.G. was allegedly bowled for a “duck” which is a cricketing term for “no score”! Once the “Syndicate” had negotiated a lease of the land with the Cobbe Estate, a local landowner was engaged to mow the fairways and greens with a scythe in preparation for a mowing machine. The early course, comprising eighteen individual holes, was laid out generously in terms of land as the founder members, precluded from any serious earth-moving, followed the valleys between the sand hills. The course has altered several times since that time, however, to become the championship course of today. The original clubhouse, a quaint wooden pavilion, was situated at the far end of the links and overlooked the Malahide estuary. It was abandoned when the boat service to and from the links was discontinued in 1973. The present clubhouse dates from this time and is sufficiently well-appointed to host major amateur tournaments as well as meeting the needs of the members and the many visitors who come to enjoy the links. The founder members numbered ten in total and were collectively known as the “Syndicate”. They were John Redmond Blood, David Francis Moore, James J. Law, James Rippingham Bristow, Henry J. Daly, William Samuel Hayes, James Henry Barrington, Godfrey Ferguson, Thomas Stewart and Daniel Martin Wilson. Law, Bristow and Ferguson were from Belfast and came to Dublin to work for the Northern Bank. Stewart hailed from Derry and was a barrister. Wilson, born in Limerick, was also a barrister; he was later to become Chief Justice and stood for election to the Westminster Parliament. The remaining founders members were from Dublin. 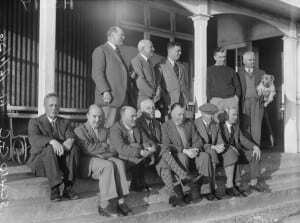 As members of the original “Syndicate” passed on, others replaced them and the practice of a “Syndicate” running the club survived until the early 1950s. As its title suggests, the last leg of the journey to play golf at The Island was by boat and there are many stories about the boat, the boatmen, the order of embarkation and the priority thereof. When the boat took a party of golfers to The Island, they were entirely dependent on the boat for the return journey. Often it happened that the weather conditions deteriorated while the golfers were “out” and they had no option but to return home through Swords. While this is the common means of travel today, it was a huge journey in the early part of the twentieth century. The signal to the boatman on the far side of the estuary to collect golfers from the links was to open a large red and white disc on the side of the pavilion. The disc was hinged in the centre and could be seen from the shore by the boatman. When the disc was in the closed position it was green in colour and blended in with the wall of the pavilion. Male annual ticket holders were admitted in 1896 and lady ticket holders were admitted the following year. 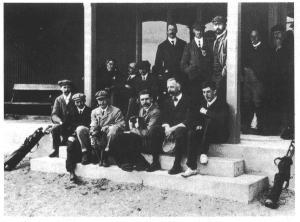 Lionel Munn (attached to North West Golf Club) and Francis Jameson (attached to The Royal Dublin Golf Club) were both annual ticket holders when they each won the Irish Close Championship in the early part of the last century. Munn and Jameson were followed by the great lady golfers of The Island namely Mabel Harrison, Janet Jackson and Patricia Jameson. 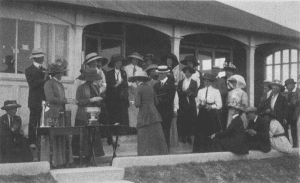 Mabel Harrison won the Ladies’ Close Championship in 1910, 1911 and 1912, followed by Janet Jackson in 1913, 1914, 1919, 1920, 1923 and 1925. Janet Jackson’s successful run was only interrupted by the Great War and, following her last victory in 1925, Patricia Jameson won the title in 1926. Mrs J.B. Walker was the next Island lady to win the Championship and she went on to play in the first ever Curtis Cup. The modern era of The Island Golf Club was shaped in 1952 when the “Syndicate” of the day handed over its entire interest in the club to the existing annual ticket holders who now became the new members of The Island Golf Club. Since the hand-over by the “Syndicate”, golfing at The Island has progressed, through increasing membership numbers, entering inter-club competitions, redesigning the links, and the continuous improvement of club facilities. The club has hosted the Irish Ladies’ Close Championship (1990), the Irish Close Championship (1997) and the Irish PGA (1999). Other Men’s and Ladies’ provincial, inter-provincial and international competitions have also been played on the links and all who have taken part have been generous in their praise of the links. Andrew Bonar Law (1858 to 1923) was elected leader of the Conservative Unionist Party in England in 1911. The Canadian-born son of a Scottish Clergyman, he played a pivotal role in Llyod George’s First World War cabinet and was elected Prime Minister of Britain in 1922. Bonar Law’s connections with The Island first surfaced on Saturday, 17th May 1913, when he played the links accompanied by Lord Glenavy (J.H.Campbell MP) who later served as Lord Chief Justice from 1916 to 1918. Also on the links that summer’s morning was The Very Reverend Reginald Godfrey Michael Webster, Dean of The Chapel Royal, Malahide, who was playing a match against the Honorary Secretary of the club, Mr J.R. Blood. The “Syndicate” at that time had close ties with the British Army and often held social functions in the pavilion to raise funds for the many Irish-born soldiers injured during the Great War. With political tensions high in Ireland between Britain and Irish Republicans during the early part of the 20th Century, and with genuine fears for his safety, Bonar Law’s visit was shrouded in secrecy. However, during the course of his match against Mr Blood, played in benign conditions over a much different links than today, The Very Reverend Webster became ill. Despite efforts to revive him, he died on the eighth tee. Word spread quickly throughout the nearby village of Malahide that Dean Webster had died on The Island and that Bonar Law and Lord Glenavy were also on the links. The Royal Irish Constabulary arrived at the scene and Dean Webster’s remains were transported to Blood’s house at Ballykilty, Malahide. “Saturday was a particularly fine day and a large number of golfers were here and there on the links-among them being the Unionist leader, Mr.Bonar Law MP and Mr.J.H.Campbell MP. The Coroner for North Dublin, Christopher Friery was communicated with. It happened that he had just left his house in Dublin for Raheny. Some of the party then drove in Mr.D.M. Wilson’s motor car to Raheny, and the motor car was placed at the disposal of the coroner. Bonar Law, who died six years later, remains the only British Prime Minister to have visited The Island. The legacy that Dean Webster left The Island is in the shape of a splendid silver trophy, commissioned in his memory by the “Syndicate” shortly after his untimely death. Each year “The Webster Cup”, a keenly contested singles competition, signals the start of the Men’s golfing season and serves as yet another reminder of the fascinating history of The Island Golf Club.